Leithart's views also prove to not be simplistic, but yet not overly complex either, which is a healthy balance for people new to this subject or new to Leithart's writing style. He makes numerous statements which will raise eyebrows among both fans and critics, but Leithart demonstrates that behind every raised eyebrow is a calculated attempt towards clarity, not ambiguity or exaggeration. 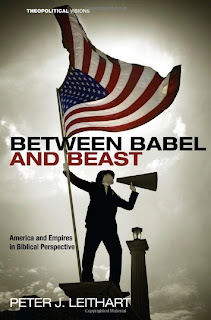 Throughout the book, Leithart says things like "Insofar as we [the United States of America] want to make the world into our image, we are a Babel. We are not a beast, but we freely consort with beasts if it will serve our political ends. I wonder how long we can stay in the cage without taking on bestial habits ourselves. "3 Leithart doesn't mince words, and so any reader should know what they're in for when statements like that are made. For those who are interested in the typological emphasis which is characteristic of Leithart's polemics, they certainly won't be disappointed either. One whopper of an example that raised my eyebrows the first time, is his contention that "Americanism is the monstrous Nephilim that people the earth when the sons of God intermarry the daughters of men. Americanist Christians are Joktanites who uncritically join Nimrod in building Babel. "4 Them's fightin words. Leithart is also very engaging in his presentation of both American history and world history. He discusses Egyptian, Israelite, Assyrian, Babylonian, Persian and Roman history. He provides detailed records of men and events in early American history as well, from Benjamin Franklin's "defensive imperialism" to the "expansionist republicanism" of James K. Polk's war against Mexico in 1846. And when discussing current events, the reader is left with a much more honest and transparent representation than the major media likes to present on the ten o'clock nightly news. How many Christians today take notice of publications such as the 1922 inaugural issue of Foreign Affairs (the journal of the Council on Foreign Relations), or the cooperation of Americanism with the IMF and World Bank? I don't know of many, and so, in my mind, Leithart presents a uniquely insightful angle from which to view current events. Leithart also discusses the relationship of Americanism with current events in Egypt, Pakistan, Saudi Arabia, Iraq, Israel, Yemen, Indonesia, Afghanistan, Turkmenistan, and Uzbekistan. By no means would it be credible to charge Leithart as not knowing his history well. And it's because he knows his history very well that he can sort through all the clutter of liberal theology and media, but still contend for the optimistic eschatological form of social and political order taught in Holy Scripture. For instance, he is not shy about presenting an argument in favor of historic biblical patterns of social order and justice, particularly patterns pertaining to Christian leaders. Leithart calls Christian leaders to grow in maturity and influence to the degree that they hold public officials accountable to the "officers of God's imperium".5 He asks such bold questions as "When was the last time an American politician was excommunicated? When was the last time an excommunication had any effect on American politics?" St. Ambrose would be proud of Leithart's faithfulness.